For Christmas I made two flannel nightgowns for my four year old. One was for her, and a matching one was for her rag doll, Charlotte. Brilliant, I thought, when I came up with the idea. Sofia has had mostly two piece pajamas all her life. She deserves a something pretty, something sweet, something special to sleep in. She adores anything feminine, fancy, or even better… with ruffles. 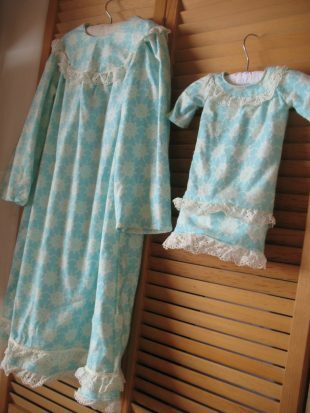 To top it off, a matching nightie for Charlotte…hey, they could even be twins. She will love it! We gave each girl a few gifts for Christmas. Sofia opened her nightgown box first. Almost as soon as she opened the present, she dropped it on the floor and was on to the next gift. Turns out, after all the gifts were opened, the Matrushkas (Russian nesting dolls) that we gave our 1 year old, were the big hit of the night. They were shiny and beautiful and definitely fancy, with long eyelashes painted on. Better yet, each doll “had a baby inside her”. What could be more fun than opening each doll to find another doll inside? I guess if I think back to being a child, toys were the most fun gift to receive, clothes were definitely not fun. Why hadn’t I remembered this until now? Oh well, knowing this wouldn’t have stopped me anyway. Sofia does like to wear her new nightie and so does Charlotte. That is good enough for me. It was a joy to stitch the nightgowns and to imagine Sofia trying them on for the first time. I also got to revisit the fun and confusion and of reading a sewing pattern… now that is priceless! Tonight as I put my daughters to bed, Olivia fell asleep on my chest, warm arms and legs draped over my body, and Sofia, in her new soft nightgown, was tucked under my arm holding her sister’s hand. I couldn’t move, I was in such snugglie bliss, that I laid there motionless, for what seemed like an eternity, feeling Olivia’s tummy move gently up and down, her heavy fuzzy head on my chest, and Sofia’s warm breath on my arm. I would do anything to stop time and hold onto that moment forever. Ah…until the next project called me. Loved the mommy made nightgowns. When my three kids were little I had a tradition to make the family matching Christmas jammies each year. Dad slept in his underwear, so he had a recycled t shirt with the chosen flannel appliqué . Now my kids are 33, 34 and 36 and they buy and give Christmas jammies each year to their families. I bought one of your cards at The Santa Fe Greenhouse nursery. Also checked out felted pieces on Etsy. If you love felt you must try doing an appliquéd quilt with cotton and felted wool. I’m finishing up my daughter’s wedding quilt and have so enjoyed the ease of appliquéing without turning edges. If you’re interested I’ll send you the link to the wool quilt wonder woman who inspired me.